Nima Saghafi has officiated in MLS, NASL and USL this season, and believes the experiences he has gained stood him in good stead for the recent USL Championship game. 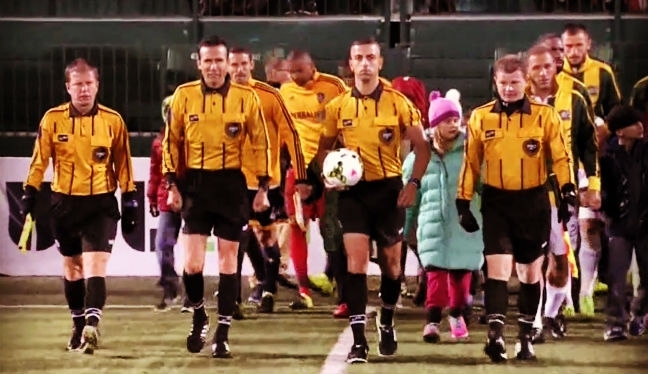 Saghafi – assisted by Eric Weisbrod, Danny Thorberry, Alejandro Mariscal and Logan Brown – took charge of October’s Final between Rochester Rhinos and LA Galaxy II, in front of over 5,000 fans at Sahlen’s Stadium. And following 18 fourth official assignments in MLS, eight NASL center call-ups and a further three in the USL middle, the referee believes he’s learned a lot this season. “I have been fortunate enough to have the opportunity to work in three exceptional leagues,” Saghafi told proreferees.com. The Championship game saw the winners of the regular season, Rochester, claim the title with a 2-1 win in overtime – something which Saghafi and his crew were always prepared for. “Full concentration and focus for 120 minutes – that was our game plan from day one. As a team our mindset was to prepare for anything and expect the unexpected. We were prepared for 120 minutes and always having a high level of urgency, intensity and work rate. “I was fortunate enough to work with a fantastic crew. As a team everyone was focused from the second we touched down in Rochester. The support we had for each other was tremendous and they were a great group of guys to share the moment with. “The preparation for the assignment began the instant I was appointed. Studying the players, key match-ups and prior games. It was a joyous moment for Saghafi when landing the Championship game assignment, but the official isn’t resting on his laurels with the soccer season approaching it’s climax. “When I received the appointment the feeling was indescribable. To have this opportunity I felt incredibly honored and delighted. “Now my target is to finish this season strong. Start strong; finish strong. I am fortunate enough to be a part of an Organization in PRO that has our best intentions in mind and that has fantastic mentors that help me advance step by step.